Home Miscellaneous How Much do Pharmacists Make? Pharmacology is a growing area of expertise in the field of medicine. There is an ever-increasing need for people schooled in pharmacy work, but before you investigate getting into the field, and the schooling involved, you’ll want to know: How much do pharmacists make? Pharmacy work is a fairly highly-paid position, but you do need to have a flexible schedule. As with any medical occupation, you may find that you have to work some nights and holidays. Pharmacists have a vital role in dispensing the proper medications for their clients, and explaining to them the ways of using the medicines properly. They have to understand any allergies people may have, as well as interactions among different drugs. The schooling to become a pharmacist includes a college level degree, along with a medical license. Due to the amount of schooling, the pay scale reflects the experience you have earned. This article will outline pharmacist salaries and other details about the job. The average salary for pharmacists in the United States is $106,41o per year, according to the US Bureau of Labor & Statistics. The salaries range from low to medium to high. The difference depends on your location, your work environment and how long you’ve been a licensed pharmacist. The lowest 10% of pharmacists in the US, as far as pay is concerned, make about $43 an hour, or roughly $89,000 a year. This range applies to new college graduates, and those who have not had their medical license for long. If the area in which you live has a low cost of living, or you work in a smaller pharmacy, you may be paid at the low end of the wage scale. The average US salary for about half of the licensed pharmacists in the US is about $58 an hour or around $121,000 per year. This is the salary range under which most pharmacists fall, with experience and working at major retail stores and pharmacies. 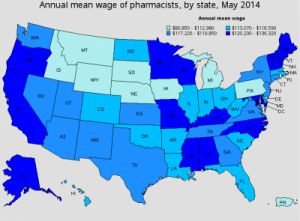 The highest range for pharmacists in the US is about $72 an hour or nearly $151,000 per year. This range is generally paid to highly skilled and experienced pharmacists or those who work in specialty pharmacies or hospitals. Below, we have included the mean wage in each state, according to the 2014 US Bureau of Labor & Statistics. A pharmacist salary is one you can rely upon. The field is constantly growing. As baby boomers hit retirement age, more health problems develop and more medications are needed. People will always have illnesses. In addition, fewer pharmacists are entering the field today. This will give you a better chance to get a good position with great pay. What Do Licensed Pharmacists Do? Pharmacists must also know about specialized dosing for people suffering conditions that may require less or more medication, like kidney or liver disease. Pharmacists receive (usually electronic) prescriptions from physicians and ensure that the number of pills and dosage are correct. They will contact physicians if something is wrong (possible drug interaction, overdose problem or allergic reaction). Pharmacists that work in hospitals may dispense IV, injectable and oral drugs given to patients. They consult with physicians on drug and treatment issues. Pharmacists in the research field work in drug studies and for drug companies developing new medication types. Additionally, they may work in government entities like the military, law enforcement or other areas. 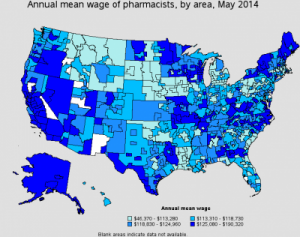 Why are Pharmacists so Highly Paid? As you determine the answer to the question “How much do pharmacists make?” it is more easily answered when you understand why they make what they do. One driving factor in salary is the simple fact that there are not enough pharmacists. Pharmacies today are staffed mostly with pharmacy techs that do much of the work, and a pharmacist who oversees their dispensing. It is difficult to get into pharmacy programs in college, as well as unpaid internships served in pharmacies. Many people drop out of the programs. This means the ones who do get their license get higher salaries. How Can You Become a Pharmacist? The steps you must take to become a pharmacist are much like those in other careers that require a degree. While you’re still in high school, take classes like anatomy, biology and chemistry, which will prepare you for a degree in health sciences. These help you in preparing for a healthcare career in the future. You may earn a traditional diploma or a GED. Be sure to concentrate on your science classes, since universities will check high school transcripts when they consider you for admission to their pharmacist programs. Apply for college and attend a four-year program that results in your earning a Bachelor of Science degree. Take required classes, including calculus, physics, sociology, biology, chemistry and anatomy. Select a school that has a program for pre-pharmacy students. This is helpful for getting into pharmacy school. Once you have passed it, you will be able to apply to pharmacy school. This is a four year program and you must focus on pharmacology. You’ll also participate in internships at pharmacies and hospitals. After you graduate and receive a degree, you’ll need to take the North American Pharmacist Licensure Examination (also known as NAPLEX). If you pass this test, you are qualified for a pharmacist job. Previous articleWhat Does Effacement Mean?